Those of you that have an addiction to iPhone/iPod apps like I do may recognize this manicure. I was at work one day, and a co-worker highly recommended that I check out this game called tiny Wings, and honestly? I promptly forgot. Fast forward to a couple of days later when I was checking the Top 50 apps in the App Store, and low and behold, Tiny Wings was the top download! I decided that I needed to check it out, and check it out I did. I paid my 99¢ and invited that sucker to join the other 160+ apps currently residing on my overburdened iPhone, and it's been love ever since. I initially noticed and adored the art style, which is sort of soft, and while grungy or dirty isn't a good description, the colors are not clean and bright in most instances. Everything looks stippled or sponged in some way, there is a lot of texture to the colors. In addition to the fun art style, the game itself is, while a simple idea, engaging and fairly challenging in some parts. :-D Anyway- enough about the app, here's my Tiny Wings nails! :) I did a different island on the fingers, and the App icon on the thumb. The icon one looks wonky and bad, my brush is old and starting to splay out it's bristles, which made it hard to make neat lines, and I was too exhausted to care. In my 2 free nights in the past week or so- I've swatched and photographed over 50 polishes! lol Reviews are soon to come- trying to catch up from not having a computer that had working internet. Nicole by OPI My Lifesaver as a base, with American Apparel Malibu Green for the bird, shaded with Orly Sapphire Silk. Essie Alligator Purse was used for the wing and head comb?, Zoya Jancyn for the beak, then mixed with MAC Dry Martini for the beak shading. American Apparel Cotton for the eyes, with American Apparel Hassid for the pupils of the eyes and to outline. For the hills, I used Finger Paints Chrysanthe-mum's the Word as a base, with CND Green Scene for the lines. For the sun, I used American Apparel Manila as a abse, then shaded with Zoya Jancyn. OPI Parlez Vous OPI? as a base, with stripes of Zoya Caitlin, American Apparel Manila mixed with Zoya Dove, American Apparel Manila mixed with Zoya Dove and Zoya Jancyn, Finger Paints Heavenly Hydrangeas, Finger Paints Heavenly Hydrangeas mixed with Zoya Dove, then Color Club Pucci-licious. Nubar Green Tea as a base, American Apparel MacArthur Park for the hill base and CND Green Scene for the stripes and 'trees'. Finger Paints Chrysanthe-mum's the Word was also sponged over the background color for texture. Zoya Dove as a base, with Orly Ancient Jade sponged over the top half. For the hills I used Nicole by OPI My Lifesaver for the aqua, and MAC Dry Martini for the dark olive stripes, as well as to outline the shrubs, which I used American Apparel MacArthur Park to paint. I have been beyond addicted to this game for the past week or so after my friend introduced it to me. I play it everywhere! It really is one of the most ingenius games for the iPhone/iPod/iPad. Plus, anyone can play, which is part of the appeal I think. These nails are genius! LOL! I just downloaded this app the other day, I love the look! Ack I'm so addicted to this game!!! :) Love your nails! Ahahha, this is the best thing i have ever seen! I love it, great job! I believe it was difficult to draw anything that is not? This is incredible! 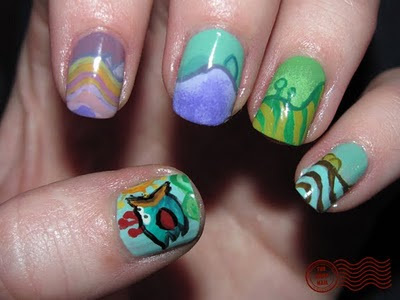 Not only because I love Tiny Wings, but because the artwork on your nails is awesome! What brushes do you use for your nail art? Love it!!! I like Your taste,colour You choose know how! En esto algo es y es el pensamiento bueno. Es listo a apoyarle.